Fast and fresh is the name of this game. This delicious salad is a meal on its own, packed with Southwestern Flavors. If you are in a real hurry, sub your favorite salsa or deli counter pico de gallo for the recipe here! This salad makes an impressive first course when guests are over, or a great dish for sharing at your next get together. Versatile and delicious, we know you will love this. Prepare the No Name Brand Parmesan Crusted Chicken Breasts according to package instructions in the oven. When the chicken is cooked, place the cleaned and cut romaine lettuce into a bowl. Toss with the Caesar dressing and place in the center of two serving plates. Place ¼ of the sliced avocado on both sides of the salads. Place two wedges of tomato on the remaining sides of the salads. Spoon the Black Bean and Corn Salsa over the top of the salads. 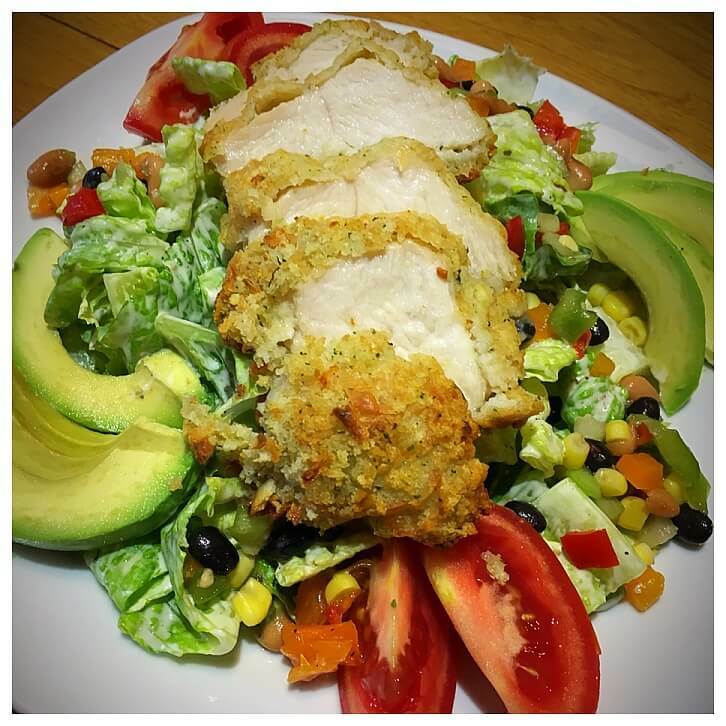 Slice the cooked No Name Brand Parmesan Crusted Chicken Breasts into slices and fan over the top of the salads. Combine all ingredients and let sit for at least 20 minutes before serving. Stir well to combine.